THE ANNUAL PARADE of Stars to herald in the 43rd Metro-Manila Filmfest will be held at Muntinlupa tomorrow. The city of Muntinlupa, in coordination with the MMDA (Metro Manila Development Authority), will be hosting it as part of their city’s 100th Founding Anniversary and as its Culminating Activity. The Muntinlupa Traffic and Management Bureau said certain roads will be blocked for the parade and advised motorists to take alternate routes. According to the Muntinlupa City government, the MMFF Parade of Stars will start from the Muntinlupa Sports Complex going to Buendia Street and Centennial Avenue. It will pass the National Road from Barangay Tunasan to Alabang. The parade will also enter Filinvest City through Corporate Avenue and Bridgeway and will end at Filinvest Event Grounds/Block 30 for a short program. Temporary closure of the National Road will be implemented from 12 noon onwards. 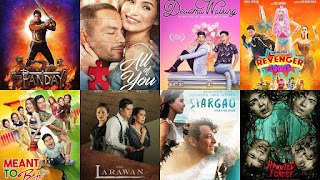 This year’s official entries are “Gandarrapido: The Revenger Squad” (Star Cinema, Viva Films), “Ang Panday” (Star Cinema, Viva Films, CCM Productions), “All of You” (Quantum Films, MJM Productions), “Deadma Walking” (T-Rex Productions), “Siargao” (TEN17P), “Haunted Forest” (Regal Entertainment) and “Ang Larawan” (Culturtain).